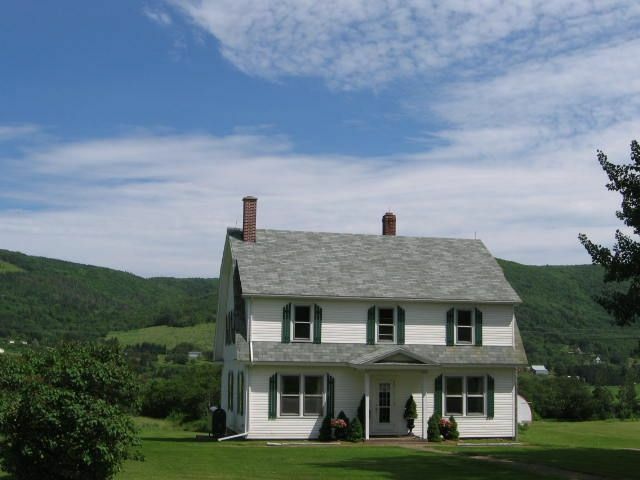 Located right on the Margaree River, famous for it's trout- and salmon fishing, this lovely Gorgeous Home, Cabot Trail property with a magnificent vista, overlooks the entire Margaree Valley and the majestic mountains of the Highlands and beyond. It is just 7 minutes from a choice of 4 ocean beaches for swimming & ocean cruises, 30 minutes to whale watching tours, 40 minutes to the Cape Breton Highlands National Park for picnics and hiking & only 5 minutes to shopping for all your vacation needs. All the small communities nearby host festivals all summer and suppers and ceilidhs (music & dancing) all year long. There are 3 Top Golf Courses located in the area " Cabot Links" "Cabot Cliffs" 25 min drive, also "La Portage" located In Cheticamp a 30 min drive ,as well as excellent seafood dining 5 min drive. The "Dancing Goat" is known for it's lovely soups & sandwiches & breakfast ,12 min drive from the "Margaree River Guest House".Canoe the Margaree River or just relax below the house, where swimming Is available to Cool Off during the Hot Summer Months! So much to see and do for the adventurer nearby. Completely newly renovated bathrooms with tiled showers and floors. In house towels and bath sheets provided with beach towels provided for outdoors. Over Looking The Margaree River,known for the Atlantic Salmon,Fly Fishing. Also Beach Towels are provided. The kitchen Is fully equipped,including cookbooks,spices etc. Flat Screen T.V. with Sound Surround. Large Spacious Deck ,with Pagoda ,Large Dining Table with Chairs to Enjoy Breakfeast /Lunch/Dinner overlooking the Margaree River,Mountain View also. Excellent property. Comfortable in every way: spotlessly clean, all systems work perfectly, well appointed and thought-out, nicely decorated, well groomed and planted grounds, and a large deck overlooking the Margaree and surrounding hills. It is an easy stroll down to the river for early morning and evening fishing. Great Cape Breton hospitality with the owner living next door. Had a wonderful time at this beautiful cottage. Michael was an great host,If you needed anything Michael was there to help. If you are looking for a place to stay in Cape Breton this is the place to stay you will be amazed at this cottage. We spent a week at Michael`s lovely Riverside home. It was all and more than we expected. The residence was impeccable and very well stocked with everything imaginable. The grounds were vast, the river very inviting, and our host Michael was a pleasure to spend time with. Without a doubt we will return. When I booked this home away from home I had no idea I would be so totally and completely in love with EVERYTHING. Michael you are by far the very best host and all of us just loved staying in your beautiful home. It had everything that we needed to be 'at home'. We had a very busy schedule and it was so nice to have your home as our landing porch. We enjoyed everything especially meeting you. Take care of yourself and thanks again for everything! We hosted our daughters wedding on the back deck with a lobster dinner and champagne toast at the river. The house has everything you need to enjoy a vacation. We stayed at Michael's guest house in July 2018 for a week and loved it! Michael was an excellent host and the house worked perfectly for our family of seven. It's literally like a home away from home, as we didn't have to worry about needing anything; it was all there. Our stay was so comfortable, like a luxury hotel in the country. Staying at the house for a week gave us a home base for our day trips around the Cabot Trail and different spots in Cape Breton. Very conveniently located; just down the road from the grocery store and also The Dancing Goat (a must go to cafe), with a beautiful private beach just down the road in the other direction. The beds were super comfy and made it possible to get a great nights sleep for the next days adventures. The kids loved having their own rooms and space, as well as excellent wifi for all our needs. It was like stepping into someone else's home and picking up where they left off. Very clean and well maintained. Laundry facilities were a bonus with seven of us staying there. The house is situated on a beautiful, peaceful, spacious property with room for little ones to run and play. Bravo to Michael; he has thought of everything with this guest house and we would recommend this rental to friends and family thinking of travelling out east in the future. Thanks for the wonderful welcome and a great week on Cape Breton Island! Designated as the top island in North America to visit, this is the perfect vacation home from which to explore the unspoiled and protected wilderness and rocky bluffs on one of the world's most scenic drives. At home, in the Margarees, either fish for salmon or trout, bathe in the warm waters of the Gulf stream ocean, or just relax. The Celtic and Acadian music and hospitality will warm your heart. The fresh lobster & crab dinners will nourish your body and the countless magical moments during fossil hunting or beachcombing or just puttering about will allow your spirit to soar with the eagles. Total Price: 1600 to 1850 Cdn Funds Per Week. Total Price: 1600 to 1850 Cdn Funds Per Week. When there Is 8 people staying ,there is a Cleaning Fee Of $200.00 Added to their fee upon arrival. Off Season Rates, available upon request. Check In Time 4 pm Or Later. Check Out time 10 am.